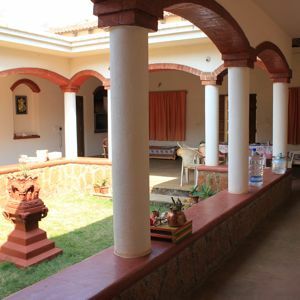 The center is located in an idyllic village Narve, 14 Kms east of Panjim on the banks of Mandovi river. A number of temples surround the area, which is close to the Mayem lake and Chorao bird sanctuary. The house has accommodation for 7-9 persons and is built according to the traditional style with a big courtyard at the center and garden around it. Google Maps link of the location.